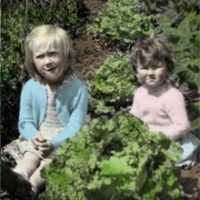 Toronto gardeners have a few consistent problems. Among them: gardening on sand or gardening on clay. Clay presents the problem of poor drainage. Yet, clay is loaded with plant nutrients that merely need to be unlocked to nourish plant roots. Sand, however, is inert – without nutritional value. It does provide excellent drainage. In fact, it’s like gardening in a sieve. Everything wet runs right down the drain. On our street, at the top of a hill in the Upper-upper-upper Beach, our soil is sand. Beneath about six inches of Norway-maple-root-infested topsoil (more on that in another rant) is feet – feet! – of yellow sand. It’s the old shore of an ancient lake. And did I mention the Norway maples? That means the garden falls into the dreaded category known as dry shade, one of the worst possible sentences for a gardener. My garden is now nearly 20 years old. That means I’ve loaded 20 years’ worth, literally tons (or tonnes, for you metric folks), of compost, manure, wet peat moss (always use wet peat moss), mulch, and occasionally topsoil into the soil to help it retain moisture and nutrients. It’s a Sisyphean task. 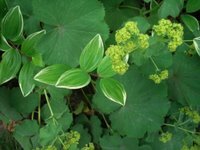 • Lady’s mantle (Alchemilla) [mixed with variegated Polygonatum or solomon’s seal at right]. This frilly edging plant has leaves like an old-fashioned caplet and frothy chartreuse flowers. The leaves also hold pearls of rain and dew. • Lily of the valley (Convallaria). Be careful where you plant this, as it can run on surface of the maple roots and soon colonize everything. But the pips are easily dug up. 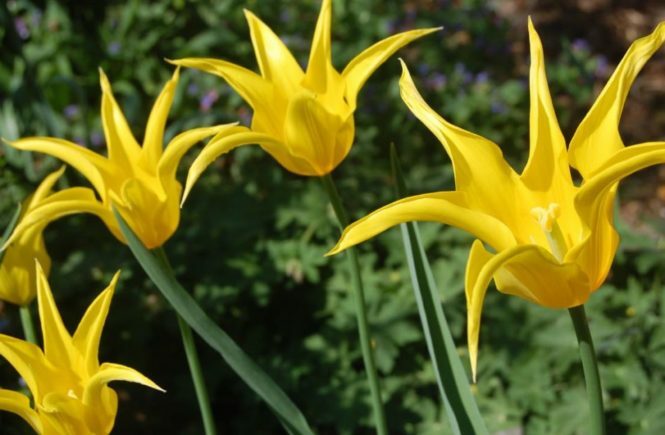 • Shallow-rooted plants such as Iris, unless the shade is dense. Irises need some sun on their roots – the rhizomes should sit on the surface of the soil – in order to bloom well. • Hostas. I have more than 25 varieties in my small garden. Hybridizers have created an amazing array of leaf colours and shapes to choose from. Some have scented flowers. • Day lily (Hemerocallis). Also beloved of hybridizers, so plenty of choices so you can have blooms throughout the season. Learn from my mistake and don’t plant the common orange day lily (H. fulva) which spreads indiscriminately. 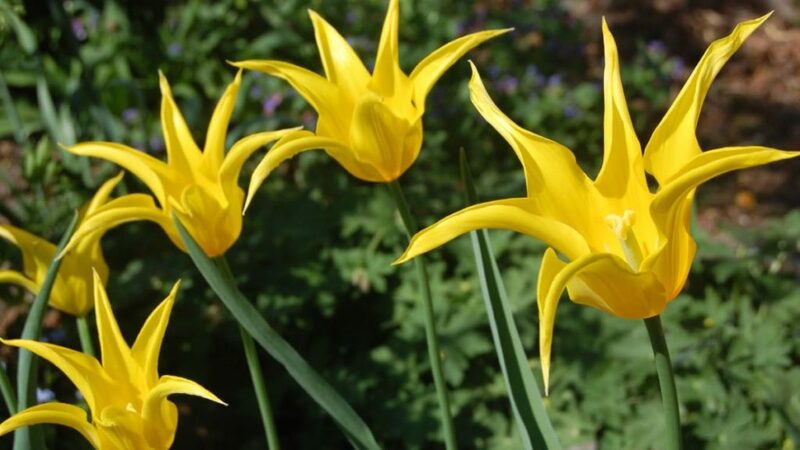 Other modern cultivars are much better behaved, the flowers have more substance and, again, many are scented.